My Auntie Mavis died last week, she was my dad's only sister and would have been 90 this year. She was suffering from Alzheimer's and passed away in her sleep. My dad is the youngest in his family, there were between eighteen months and two years between each of his siblings. 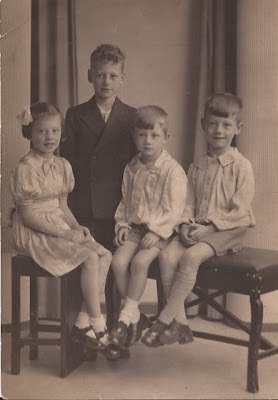 Walter was the eldest, then came Mavis, George was next and then my dad. Both Walter and George died in 2011, the same year that two of my mum's brothers died too. Mavis and my dad weren't particularly close, they didn't see each other very often but my dad got a bee in his bonnet last year about wanting to go and see her in the nursing home where she was being cared for. She didn't know him when he went, owing to the Alzheimer's, but I think he's glad now that he made the effort. My mum came from a big family, some of her brothers and sisters have died but she's still got two sisters still living. My dad is the only one still here from his family, Walter's widow died last year, she was the last of his sibling's partners who was still living. It's terribly sad seeing the older part of the family dwindle but then we hear the news that one of the younger generation are expecting the patter of tiny feet, life goes on. My mum was the last left in her and dad's family, which sadden her, but like your last comment, it's about looking forward to the younger generation. Mum said life always came in 3's, A death, a birth and a wedding, so who is getting married this year? I think it's sad when you're the last left in your generation. Saying that, it's better than the alternative. I haven't heard of a wedding in the family yet but that would be exciting, wouldn't it? So sorry to hear your news Jo. The same is true of my family - there's only one auntie left and once she's no longer with us my brother becomes the oldest living member of the family. She's 95 and still going strong so hopefully she'll have a few more years yet. Thank you. How lovely that your auntie's still going strong at 95, it's a great age to get to and still be well. Awww so sorry about your Aunty Jo. My mum is the last of her family, she was the youngest of 13 children! She was quite close to all her sisters, especially as they all got older mum would do little jobs for them, shopping and such or just keep them company. In turn all my cousins still visit my mum doing little jobs for her. I think it great they all kept in touch, so glad your dad made the decision to visit his sister before she past. Thank you. It's lovely that your mum kept in touch with all her sisters and that your cousins are now still close to her. My mum was the fifth of eleven children, she has one older sister and one younger sister still alive but they don't live close by. My mum moved away from Leicester when she married my dad, he was from Leeds, so she's never lived near her family since the 1950's, though they did visit and she always had very big phone bills! I'm glad my dad got to see Mavis one last time, he's been reminiscing these past few days. I think that's the way we'd all like to go when the time comes and somehow, it does make us feel better when our loves ones pass away in this way. Thank you. It's lovely for you to have your nan still around, I'd lost all my grandparents by the time I was eighteen and I've missed them through my adult life. I'm sorry to hear about your mother in law, it's very hard to watch our parents age, especially when they're not in good health. I know all about that with my own parents. Thank you. I'm glad my dad got to see her one last time, she didn't know who he was but it was for my dad's sake really, he'll be settled in his mind that he went to see her. If she had that terrible disease, it's a blessing, that she passed. Alzheimer's is a terrible thing, my mum's suffering from it now and it's horrible watching it take a hold. I'm sorry to hear this news. I'm glad she passed away peacefully in her sleep. I think that's how we all want to go, isn't it? Happy news though, the arrival of a child, the circle of life. Thank you. I think she'd got to the stage where she didn't know who anyone was and she she didn't know where she was either, it's a horrible way to be. It's always sad when someone dies but you have to wonder if it's kinder for her. Thank you. It's nice that your mum is taking more of an interest in her nieces and nephews now that their own parents are no longer here, it'll be good for them but good for her too to have extra company. I was just saying to my dad today that I'm lucky to still have both my parents, none of my cousins have either of theirs now. Alzheimer's is in both sides of my family, it's prevalent in my dad's side and my mum's suffering from it now too. It does make me worry a bit, I have to say. Thank you. Time goes by so quickly, doesn't it? It's twenty years this year since my sister died, I really can't believe that, it only seems like yesterday. I'm sorry to hear about your Aunt Mavis, Jo. I'm glad your dad was able to see her before she passed. Thank you. I'm really pleased that my dad managed to see her one last time, I think he'd have regretted it if he hadn't. Thank you. It's a sad time but we've been remembering all the happy times over the years. So sorry to hear your news. My family too is dwindling and it appears dementia seems to be an issue. Although thankfully despite health issues dementia doesn't appear to be an issue for my parents. Take care. Thank you. Dementia seems to be more and more common these days. It's quite worrying for me with it being in both sides of the family. What a lovely photo and what a good job your Dad went to visit his sister before she sadly died. I think so too. I'm pleased to have this photo, I think it's really charming. I'm so sorry to hear your sad news. It must have been difficult for your Dad to visit his sister in the nursing home knowing she was suffering from dementia, but I hope it has put his mind at rest that she died peacefully and he was able to see her last year. I know that you're looking after your Mum who is not well so I'm thinking of you as you and your family care for her. I'm glad that you have the treasured photo of your Dad and his siblings. Thank you. I think it was quite a shock when my dad visited Mavis but I'm sure he was pleased to have seen her, especially now. Alzheimer's is such a horrible disease. Thank you. It's really sad when loved ones are no longer with us, especially when there were so many in the family. I remember the family coming together for weddings and christenings but now it only seems to be funerals. Always sad when a much loved family member is no longer with us. Sometimes when its due to alzheimers or other similar illnesses its a release for all concerned. I only have 1 great aunt on my late dads side left, and she has vascular dementia but at 93 she has had a very long and fulfilled life before this diagnosis last year. My Auntie Mavis had been in a nursing home for quite a few years and she didn't know anyone any longer. It's a terrible illness which takes people away from their families before they actually die, so sad. Sorry to hear about your Aunt, but looking forward is the way to go. My Dad was the youngest of 5 & was the last to go. We also had quite a few Walters on my Dad's side including my grandfather & Dad's oldest brother. Take care & stay warm. My Uncle Walter was named after my grandpa's eldest brother who came home from the war and then died of his injuries. All the boys were named after someone, my Uncle George after my grandpa and my dad after his maternal grandfather. I've no idea where Mavis came from though. Thank you. It's a terrible disease, it's quite scary wondering if you'll get it or not. I think my dad's glad that he made the effort to go and see her, I think he knew it would be the last time he'd go. I'm sorry to read this news Jo, Alzheimer's is a horrible disease, I'm pleased that your Dad got to see his sister. It's so true when you write "It's terribly sad seeing the older part of the family dwindle but then we hear the news that one of the younger generation are expecting the patter of tiny feet, life goes on." Yes, life does go on, not always easily but it does (and must) go on. The memories we are left with become so special and are always cherished. I know we all have to go at some time but it never makes it any easier, it's very sad to lose another member of the family but as you say, we always have the special memories.